During our day trip to Wyoming, it ended up snowing. A lot. So we really didn't get to do as much as we wanted to while we there. We did, however, drive up to the Ames Monument. I got out for a split second just to take a photo (it was freezing cold!). 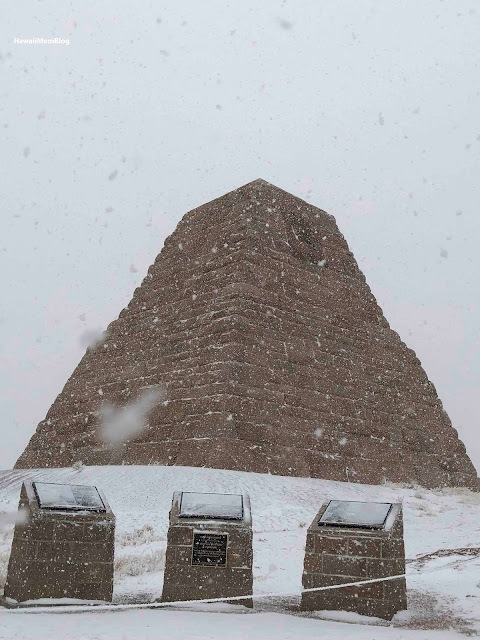 Built by the Union Pacific Railroad Company, the 60-foot high granite pyramid is a memorial to the Ames brothers Oakes and Oliver, who were integral to the construction of the first coast to coast railroad on the continent. The monument stands at the highest elevation (8,247 feet) of the original transcontinental route.